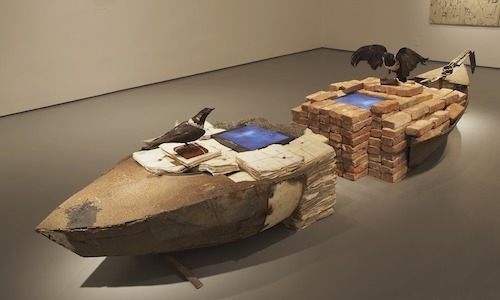 António Ole, Margem da Zona Limite (On the Margins of the Borderlands), 1994–95, iron, bricks, embalmed crows, paper, archive folders, TV sets, dimensions variable. World of Writing, 1985—produced in Los Angeles, where Ole studied film—brings to mind comic strips and the post-Pop discourses that influenced the artist in the 1970s. Sobre o consumo da pílula (On Taking the Pill), 1970, for instance, connects the birth-control pill to Pope Paul VI. Elsewhere is Untitled (Portraits Series), 1973–79, a piece composed of six black-and-white portraits. The everyday people in these somber pictures feel like silent witnesses to Angola’s fight for identity and independence from Portugal. We experience the documentary facet of Ole’s work as well through a number of his films. Conceição Tchiambula, um dia, uma vida (Conceição Tchiambula, One Day, One Life), 1982, explores the daily life of a female rural worker, and No caminho das estrelas (On the Road to the Stars), 1980, is an examination of Agostinho Neto, the first Angolan president after the country’s separation from colonial rule. The artist offers up more personal and poetic ways of experiencing history, too: Margem da zona limite (On the Margins of the Borderlands), 1994–95, is his first large-scale installation that includes video. It features a canoe cut in half with, among other things, bricks, taxidermied crows, and bundles of paper. It suggests a dramatic split—perhaps a reference to Angola’s civil war, which dragged on until 2002. Township Wall, 2004, is a vast and colorful panel comprising found objects, wood, corrugated plastic, iron sheets, and glass. This “mural” is a testament to the creativity of disadvantaged urban populations who manage to build something from nothing, surviving through artistic transfiguration.